Xbox Live Indie Games might not be a perfect match for Zeboyd Games, but it needs a little help before moving on. One of the most unique Xbox Live Indie Games developers out there is Zeboyd Games, a team of three that have already made a name for themselves with two humorous, retro-style RPGs called Breath of Death VII and Cthulhu Saves the World. However, due to the structure of the XBLIG platform, it's just not cutting the mustard. Zeboyd needs a little help to bring its style of RPGs to the PC and beyond, and has set up a Kickstarter donation page in the hopes of getting that help. Microsoft pays XBLIG developers in what appear to be inconvenient quarters, meaning that profits from the first portion of 2011 won't be paid until May. This is one of Zeboyd's issues. Another is that while the $3 Cthulhu Saves the World, Zeboyd's latest release, is selling very well for an XBLIG game, that unfortunately still means it's only moving an average of around 200 copies per day and declining. Zeboyd isn't complaining, but the current level of sales cannot support full time game development. Zeboyd posted on its website: "XBLIG is quickly proving itself to be a less than ideal platform for our kind of games. If we want to become a full time development studio, then just making games for XBLIG is not going to work." Through its Kickstarter page, Zeboyd is trying to raise $3,000 to port Cthulhu Saves the World to the PC. With the port will come the addition of a mode nixed due to time constraints called Cthulhu's Angels, an obvious parody of Charlie's Angels where Cthulhu is too lazy to be a hero and convinces a group of "talented women" to do some heroic deeds for him instead. This content will also be patched into the Xbox 360 version. Zeboyd adds that once the PC port of Cthulhu is finished, Breath of Death VII is a shoe-in for a port, and future games will likely go multi-platform as well. Like all Kickstarter donation rallies, supporters will be rewarded based on amount given with anything from chiptune remixes of Cthulhu's soundtrack to tiny Cthulhus, or even with a role as a townsperson in an upcoming game. 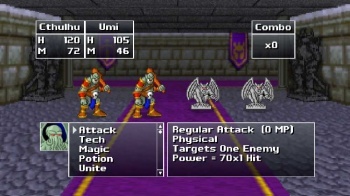 Zeboyd's two available products are both enjoyable RPGs developed with an interesting sense of humor. Despite a retro exterior and casts of silly characters, they have strong underlying JRPG-style gameplay mechanics that make them successful and worth playing to the end. I'd personally like to see what a company like Zeboyd could do working full time at their craft with a comfortable budget, as all its efforts up to this point have been part-time only. If you feel the same way, Zeboyd's Kickstarter page is here.